The fired deputy chief of staff for Concealed Pistol License processing(talk about bureaucracy when you need a deputy chief of staff for such things...) alleges that clerks were offering expedited service for issuance of the permits in return for a $50 expediting fee. This is bad enough considering there is no provision for such a fee in the law, nor any proof the fees did anything other than allegedly lining some clerks' pockets. He also, and even more disturbingly, alleges that permits were being issued to felons and other disqualified individuals who are not otherwise eligible for a permit. Before shall-issue became law in Michigan, it was pretty well known and understood that the only way you could get a permit in many counties was to be connected politically or make an appropriate monetary contribution. It is sad to see that some in Wayne County are allegedly carrying on that tradition. Will and Kate, how's this for a royal honeymoon in Detroit? Yes, you may pick your jaw up off the floor now. Other inspired suggested honeymoon spots for the happy couple: A tour of the Bight of Benin; followed by punting on the Somes River; and then have some happy times in Moldova? The American Bar Association is concerned about the lack of the American public's understanding of civics and the low level of political engagement by the youth. In Flunking Civics: Why America’s Kids Know So Little, the ABA expresses concern that civics are not being taught well in schools or elsewhere. Well, with a public education system that has constantly downgraded the importance of civics and history, what does the ABA expect? The study ranked history standards in 49 states and the District of Columbia (Rhode Island has no mandatory history standards, only suggested guidelines) for “content and rigor” and “clarity and specificity” on a scale of A to F. Only South Carolina got straight A’s. Nine states’ standards earned a grade of A- or B. But a majority of states—28 in all—had standards ratings of D or F, the study found. It is a real concern, as a democracy's citizenry untaught in its history and governance, and ignorant of its history and the history of the world, tends to not choose its leaders wisely. .. . the disappearance of traditional newspapers and TV news shows that objectively report information, youngsters have become increasingly disengaged from civic and political life, experts say. Ah yes, the golden olden days of the objective mainstream media reporting - when was that again? Since the late 1990s, when American students tested poorly in reading, science and math against students from 20 other Western nations, federal educational policy has focused strongly on those three subjects at the expense of history, social studies, government and civics. That trend began in 2001 with the Bush administration’s landmark No Child Left Behind Act, which gives priority to federal funding for efforts to improve student performance in reading and math, skills that are considered fundamental to student success in the workplace. Not only is civics lacking, but apparently so is math, history, and logical reasoning. The 1990s, dare I say, preceeded Bush so the trend can't have begun under Bush in 2001 a decade later, no? It is true that there has been more of a focus on those areas since NLCB cosnidering performance in them was also woeful, but schools have been neglecting civics for far longer than Bush had been in office. This federal meddling in education being complaint about in the article is of course a further argument to get the feds out of education but that might be too complex a separation of powers argument for this study's civic-knowing authors to handle for now. The problem is exacerbated by evidence of what researchers describe as a growing “civic achievement gap” between white, wealthy, native-born youths—who demonstrate consistently higher levels of civic and political knowledge, skills, attitudes and participation—and poor, nonwhite and immigrant youths, who are thus at a disadvantage politically. Well yes, if you're in a lousy area in lousy public schools coupled with not having been here as a child to learn civics in the first place, it is a shocker that you're at a disadvantage and don't know civics. The sidebar of the article (at the bottom of the page) "American Know-How & the ABA" gets even funnier in that it blames conservatives for the decline in teaching "progressive" civics in schools. Yes, really. In any case, it is nice for the ABA to recognize there actually is a problem. Perhaps they could urge other states' to adopt South Carolina's curriculum? Surely UN can't be Syrious? Really, while Syria is busy shooting down its own people in droves, the UN dictator's club is busy electing it to the Human Rights Commission. Luckily, since the main (and almost sole) effort of the UN HRC seems to be condemning Israel, Syria should fit right in. Oh, and under the Barack Obama administration, in a reversal from the Bush administration, the US is now supporting, legitimizing and approving this charade of a "Human Rights Council". After 11 years since its production and 8 years in my care and over 152,000 miles, it was time for the Jeep to go. 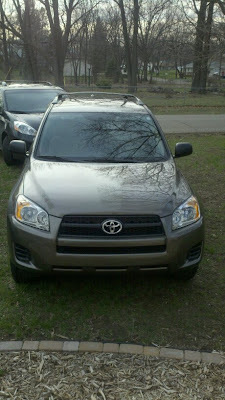 So introducing the new dive-, shooting-, kiddie transport- and everything else mobile my new Toyota RAV4. My first new car, ever. Now I know what they mean by that new car smell. 11 Years worth of technology upgrades and automotive know-how makes this a very smooth and fuel efficient ride. So much so that I calculated I'm going to save $80 a month in gas at current prices. The 4 cylinder engine has plenty of pep and while it is not as quick on acceleration as the Jeep with the straight six, its actually pretty close. I've already taken it to the dive site and the side opening rear door is perfect for gearing up - unlike the Jeep it does not come crashing back down on my head at awkward moments, such as when both arms are busy. The tanks and gear fit in perfectly. The interior is quite roomy with everything laid out in a logical fashion, the seats are more comfy and form fitting and the suspension is so much nicer. In short, its a very impressive vehicle and should be very suitable for everything I need it to do. I spent quite some time online researching compact SUVs to decide possible worthy successors to the Cherokee. Now I did try at first to buy American, but was stumped. You see, in the Detroit area they don't advertise the price that you as a consumer will actually be charged for the car. No. Instead it is the employee price plus lease loyalty and all sorts of other discounts that the non-employee doesn't qualify for so figuring out what you will actually be facing when you go to sit down and make a deal is just about impossible. That is how a Jeep Liberty advertised as a $144/month lease ended up being $286-296 after the test drive and once we sat down to discuss it with the salesman (even with a CDI number I was being given by a friend), and the Jeep Patriot ended up costing even more! Apparently the Patriot's residual value is so bad, you can buy it for just $60/month more than the lease. As to the Jeep Liberty, I was hoping it would be a worthy successor to the Jeep Cherokee it replaced. The current version doesn't even come close. The steering was brutally stiff, so much so I wondered if the power steering was defective, the ride extra harsh and pickup seemed much less with as much road noise as the old Jeep. The turning radius was worse as was the overall responsiveness. After 11 years of engineering and IMHO an inferior engine that is all of 2 mpg more fuel efficient than the Cherokee it replaced, not impressive. In addition, the setup and height into the passenger compartment made it very hard for the kids to get up into the back seat - far worse than the Cherokee. If you want truck-like handling that makes it feel like a much larger truck than it is along with feeling every bump on the road in your lumbar region (this is not a good thing), go for it. The Jeep Patriot was rather intriguing - 4WD, smooth handling, fuel efficiency with a 4 cylinder almost matching the RAV4s, good pickup, a decent layout and a CVT transmission that was capable if very noisy, but the price was ridiculous and a deal breaker. The salesman weren't willing to work things out package wise and couldn't make a 4WD fit our budget requirements. Maybe in three years when this RAV4 lease ends I'll look again at some Patriots coming off lease if they hold up. I expect they'll be going for quite cheap as most of the value of it will have been paid for in the 3 lease years. Thence we went to Toyota and the experience was completely different. At the Toyota dealership the advertised price was the actual price on arrival at the dealership. Quite refreshing after the Jeep experience. The sales staff were friendly, not pushy and very helpful in getting cars out to try and answering all my questions, not to mention encouraging me to take my time and thoroughly drive the car to be sure I like it. So I now have a new RAV4. Something to be said about the capitalist system when you can get a superior and more refined automobile for less than a demonstrably inferior one. So my first non-American car and so far its been a top rate driving experience. I'll miss the Jeep but I'm really enjoying my new ride. As Murphy's Law has related, he traveled to this pleasant peninsula and together we went to the fabled pit to play with his new M-60. I also had a chance to shoot my new-to-me PA-63 and Bulgarian Makarovs, and a more detail review of both will come later. I also shot my M&P 9, but it was so windy our target stand wouldn't stay up so fast draws on cans and boxes had to suffice. But back to the important stuff: Shooting the M-60. In one word - Awesome! At the very least, I call designated ammo bearer Assistant Gunner. The dive was originally set for noon today but unbeknownst to me was rescheduled for 8:30 am later last night after I had gone to sleep. Luckily some other divers namely James and also decided to skip the 8:30 dive and we met around 3-ish and got in the water. There's already some boat traffic on Union Lake but it wasn't too bad. Visibility was considerably less than just 11 days ago with quite a bit more weed growth and the boats are already stirring things up. There was quite a bit of lake life to be seen: A huge Bass that got close enough to practically touch and a ton of crayfish, some approaching red-lobster-for-dinner size. We also chanced upon two crayfish having an amorous encounter, something you don't see everyday. There was also a spurned crayfish just a short distance away feeling all rejected. We left the crayfish undisturbed in their crustacean reproduction efforts and continued on our way. The dive was very good, I was feeling great, buoyancy and trim well under control and I had a great time, even if a bit chilly. A good time with some friends on an Easter Sunday afternoon. David Bernstein over at The Volokh Conspiracy notes the end of a pro-palestinian International Solidarity Movement volunteer from Italy who, while working to shield the terrorists of Hamas, was kidnapped by another Islamic terrorist group and killed when Hamas failed to meet the splinter group's demands. Bernstein also points out a particularly asinine tweet by the ISM about the murder. Sort of an "own goal" as it were, not to mention a stupid choice of hostages. You know Hamas doesn't see the ISMers as anything more than idiot human shields and propaganda pieces, so his value as a hostage for trade was nil (for a prior example, see Corrie, Rachel, Pancake). Either that, or the whole event was a setup to create an image of Hamas as comparatively moderate, which some media outlets already seem to have accepted. Had to say which really and it might be both at once. Arab League wants a No-Fly Zone over Gaza. Not to stop Hamas and friends from firing missiles at Israeli schoolbuses of course, but to stop any defensive response. Low Dog on the Totem Pole makes some good points on the absurdity of the suggestion. Good luck with that one Arab League, and quit trying to have the west do your anti-Israeli activities for you. Progressive types love mass transit. Whether it be the current siren song of high speed rails to nowhere or busses to shlep the hoi polloi to the progressives' neighborhoods for work and back to their humble abodes, they likes it muchly. There is of course a problem with mass transit. The drivers, being unionized liberals themselves tend to go on strike or out sick as they fancy. In this case Detroit bus drivers called in sick so they could attend a union National Day of Protest in lansing. Extra delays of 30 minutes or more for city bus riders will be the norm today after more than 80 Detroit Department of Transportation drivers called in sick to join protests in Lansing against Gov. Rick Snyder’s proposed budget cuts, officials said this morning. Now if I called in sick under false pretenses, that would be grounds for termination. For the 82 Detroit Amalgamated Transit Union member bus drivers, not so much. Mayor Dave Bing’s spokeswoman, Karen Dumas, said the drivers would not be paid for the day off. Troy McPherson, 19, a fast-food worker from Detroit, said he believes in the right to protest but didn’t think it was proper for drivers to disrupt the city’s already slow, unreliable bus service. A comprehensive and reliable mass transit system can be useful. one that is unreliable to begin with and one that can be disrupted at the will of a union, leaving its riders in limbo, not so much. Spring is here, the ice was off the lake, and it was time to go diving. Chad, Rob and I headed into Union Lake to shake off the winter blahs and check our newly serviced equipment last night. The water was markedly warmer than it was during my last dive in December when it was 36 degrees, but at 45 degrees its not exactly what you would call warm. I had on a heated vest that we're still testing and while it disconnected itself under water it did provide a nice initial kick of heat. A bit more product improvement and I'll be comfy. There were lots of lake life on display as no boats had yet gotten in the water to scare the fishes. Lots of large bass, a blue gill and even a large pike was seen near the boat launch. Once the boats enter the water the pike will be gone from the area to be seen only farther and deeper out into the lake. Many crayfish were in abundance, lots of small bass and other fish were seen and there were three mudpuppies to be seen, including a very cute little one. So a very good dive indeed. Buoyancy and trim was good on the dive, all the equipment functioned properly and no problems. Then we went to the Sweet Water Bar and Grill for some adult beverages to celebrate the opening dive. It was a nice, enjoyable dive and a good way to open the season. 150 Years ago today, at 4:30 a.m. April 12, 1861, the artillerymen commanded by Confederate Brigadier General Pierre Gustave Toutant Beauregard opened fire on Ft. Sumter in Charleston Harbor. 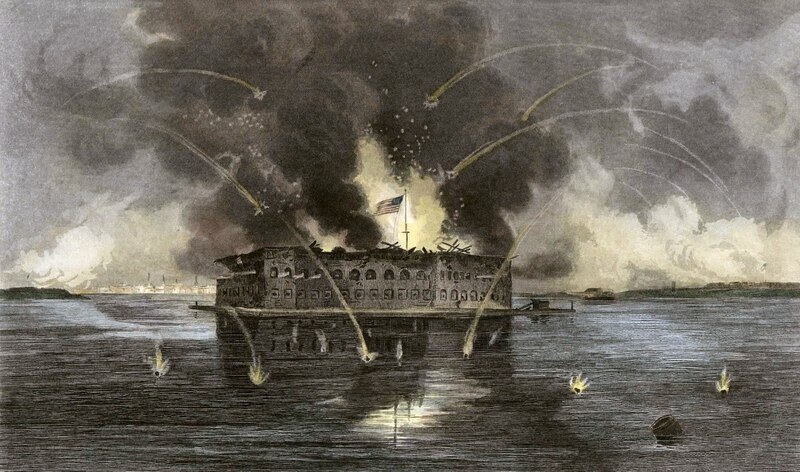 The firing on Ft. Sumter was the opening battle of the American Civil War. Beauregard's artillery instructor at West Point, Major Robert Anderson was commanding Ft. Sumter at the time and had refused Confederate demands that the Fort be surrendered. The Fort surrendered the next day without a Union soldier being killed (one was later killed in the hundred gun salute negotiated as part of the surrender that was reduced to a 50 gun salute as a result). The Fort was returned to Union hands on February 22, 1865. The Civil War would become America's most bitter conflict with over 618,000 killed and exceed all casualties in all of America's wars from the Revolutionary war through the Vietnam War. The battles in the war had casualty counts that rivaled American losses in the major battles of World War 1. Indeed, the Civil War in many ways foreshadowed the nature of combat in World War 1, and the bloodiest day ever in American military history was September 17, 1862 at the Battle of Antietam/Sharpsburg. For an excellent overview of the US Civil War I'd recommend John Keegan's The American Civil War: A Military History It gives an excellent lesson in not just the military conflict but its cultural, social, political and economic background and effects and is quite well-written. After reading Keegan, there are a multitude of other excellent authors to delve into from sweeping overviews of the war to microcosmic analysis of individual battles down to the experience of a private on the battlefield itself. The US Civil War is one of the most written about topics in American history. There has been a book published about the Civil War for every day since it ended and more will continue to be published on the topic, especially this year. A road built through a swamp built out of logs for the movement of troops in the War of 1812 is featured in the Detroit Free Press today. 607 of the original logs are still in place and a visible marker of "Hull's Trace", the road built by General William Hull with that section built around July 4, 1812. Pretty impressive that the remains of the log road are still there, almost 200 years later. As yet another example of the more things change, the more they stay the same, people were bitterly complaining about the lousy conditions of Michigan's roads back then, much as they continue to do so today. The wreck of a Doernier Do-17 bomber has just been officially confirmed to have been found on a Kent sandbank. This twin engine Doernier Do-17 bomber is the only known remaining example of the type. The bomber was found by a fisherman and then identified by some recreational scuba divers. It currently rests at a depth 50 feet on a sandbank and is in such good condition that the Royal Air Force Museum plans to raise and recover it. Some very neat side-scan sonar pictures, showing the aircraft as it currently lies in the sand can be seen at the link. This Do-17 is most likely the bomber that was shot down on August 26, 1940, the original combat report of the downing of the bomber can be read here. None of the over 2,000 Do-17s built were known to have survived to the present, so if this one can be recovered and restored, it will be a unique historical aircraft and a fitting display for the memorialization of the Battle of Britain. The dogs are attacking mail carriers and otherwise making nuisances of themselves. Of course, dogs are not the only threat mail carriers and others face in Detroit, there's human animals as well. Wesley said dogs aren't the only problem. His letter detailed three incidents since December in which carriers were caught in gunfire and another involving a carrier accosted with a gun. "In my tenure … I have never seen the multiplicity of dangerous events spiraling at the same time," the letter read. In other words, Welcome to Detroit 2011. So are the Police looking for Phelpsian supporters as suspects? A spokesperson for the Washtenaw County Office of the Sherriff said the department got two complaints around noon today that the road sign on Ridge Road near Holmes Road displayed the message "God hates (N-word)". Police removed the sign and are now trying to figure out who tampered with it. Hamas Scumbags Attack School Bus, World Media Yawns. Hamas terrorists launched an anti-tank guided missile at an Israeli school bus. The missile critically injured the driver and a teenager. Luckily the bus was nearly empty when struck or it would have been much worse. They also fired multiple mortar rounds at Israel. At the link above you'l see Honest Reporting notes on how the biased media reported on the event. Jerusalem— An anti-tank missile fired from the Gaza Strip struck a school bus in southern Israel Thursday, wounding two people, one of them critically, prompting fierce Israeli retaliation that killed five Palestinians. Israel unleashed airstrikes and tank fire against Hamas targets across the border. It was the heaviest assault on the coastal territory since a broad military offensive two years ago. Besides the dead, more than 30 Palestinians were wounded. Nice subtle bias there, and no mention of the over 50 mortar rounds fired by the Hamas scum either. Considering it was an anti-tank guided missile, Hamas terrorists deliberately aimed at the school bus -- yes when you deliberately aim at a school bus carrying children you are a terrorist, period -- and admitted they did it. You'll note that Islamic terrorists have quite a habit of attacking children. Like the cowardly scum that they are, they like to attack those who can't fight back and those whom western society accords a high degree of value and protection. Solomonia has an interesting post on this phenomenon. Hamas needs to learn that attacks on children have real consequences. What if Moses had the Internet?